Race fans start your engines! The game is about to begin. Kids play it until they drop. Grown-ups peel out for it. Even grandmothers turn into rabid weasels over a game of Pitstop. What is Pitstop? 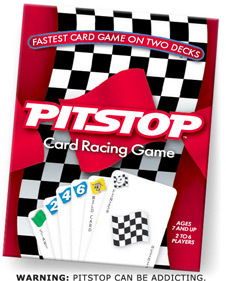 A fun family card game based on a simple idea: Players race each other to complete a run of numbered “Lap” cards; then be the first to play the checkered flag card to win the game. But there’s a catch. Pitstop cards lurk in the deck and they can ruin any dreams of a quick win. A game of Pitstop can be fast and furious because players can play all the cards in their hand in one turn and Lady Luck, in the form of prized wild cards, can make or break a racing career in a hurry. One of the best things about Pitstop is that it can take as little as 5 minutes for one game or all day for a Pitstop tournament. Race Season rules are included for a 10-race, 20-race or whatever-race competition. From 2 to 6 players can play Pitstop and it’s fun for anyone 7 and up. The game consists of 108 unique, racing-themed plastic-coated playing cards, divided into two decks. English and Spanish rules come with Pitstop and can be found on this web site along with Official Pitstop Score Sheets. Just about anybody with five minutes on their hands and a short attention span will go for Pitstop. Probably even you. Ask for it wherever toys and games are sold or buy it right now on the secure Pitstop shopping page.